Buy this book online at Amazon Books or Powell's Books or your local bookseller. 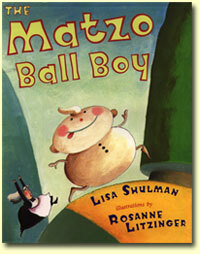 In this fractured retelling of The Gingerbread Boy, a lonely bubbe (grandmother) makes a boy out of matzo meal. When she checks the bubbling soup pot, the matzo ball boy jumps out and runs off to see the world. Escaping the bubbe and several villagers, the matzo ball boy runs straight into the open arms (and empty bowls) of a poor man and his wife. To quote the book’s last line: You were maybe expecting a different ending? I think it’s fun to retell fairy tales and folktales. I like changing one thing in the story, and then seeing what else needs to change or stay the same. the author changed the setting of the gingerbread boy story. I was cooking dinner at the time, and I started wondering what would happen if the gingerbread boy was made out of something else. We eat a lot of matzo ball soup at my house, and it didn’t take long for me to come up with the idea for a runaway matzo ball. At first I had the fox eat the matzo ball boy, just like in the original story. But my editor wanted me to add more of a twist at the end, to make The Matzo Ball Boy different from The Gingerbread Boy. So, after a lot of thinking and rewriting, I came up with what I hope is a tasty ending for the reader.